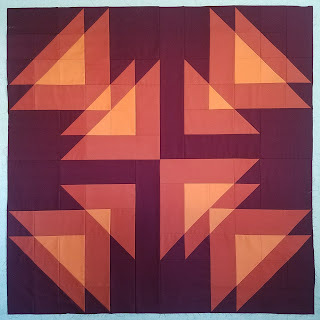 A few days ago I stumbled upon an Instagram post by @quiltingjetgirl about the One Monthly Goal link up hosted by Elm Street Quilts. If you read my 2018 goals you know that I'd really like to be better at blogging. This link up seems like a great way to help myself stay focused on a specific goal each month AND give me an easy way to stay on track with blog posts. I love the One Monthly Goal link up because it allows you to pick a goal that is manageable. "Any goal that involves a step in the process of making with thread, fabric or yarn is a valid goal." Another goal I had for 2018 was balance. So in the spirit of supporting balance and not overcommitting myself, I am going to pick a simple goal that I know I can achieve. It is against every fiber of my being to pick a goal that should be fairly easy to accomplish, but it meets the requirements so I might as well give myself an easy win to start the year! This square has been on my design wall for a few weeks. All it needs is the corners, so I will complete the top January. This is my (simple) One Monthly Goal! Linking up with Elm Street Quilts One Monthly Goal January Linkup. Looks like we both had the same idea! LOL I just looked at your post, glad I'm not the only one!!! Good luck getting it finished! Can't wait to see the finished project. I love that we have the same goal. You are further ahead than me though! Great colors! This will be a great quilt! Looks great. Thanks for linking up with Elm Street Quilts One Monthly Goal and good luck with your project. I like this pattern and your fabrics ! Good luck for your goal ! Hey, man! Easy goals are awesome! Little steps linked together make a whole journey. Love your autumn vibe in this. A finish is a finish! I love the quilt, such great colors.